Colorado student athletes are celebrated by the John Lynch Foundation at Mile High Stadium. Photo courtesy of the John Lynch Foundation. 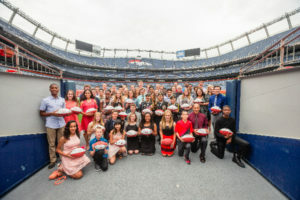 Last month, the John Lynch Foundation hosted its Star of the Month Celebration at Sports Authority Field at Mile High Stadium to recognize a few of Colorado’s outstanding student athletes for their extraordinary achievements in academics, athletics and community involvement. John and Linda Lynch presented more than 60 awards for the Star of the Month; Rising Star of the Month; and Coach of the Month to students and coaches from across the state. While awards are announced throughout the year from October to April, the winners, along with their families, attended the official ceremony in the United Club Level of the stadium. This year-long program encourages positive recognition for the student athletes and coaches who are excelling beyond their chosen sport, the classroom and the community. Every month teachers and coaches can nominate students for the awards through the John Lynch Foundation. A volunteer selection committee reviews the nominations and determines the winners. Scott Reiman and The Reiman Foundation is an avid supporter of programs such as Star of the Month and other initiatives that foster academic excellence and provide the resources to develop our future leaders.